Today's the day my friends! 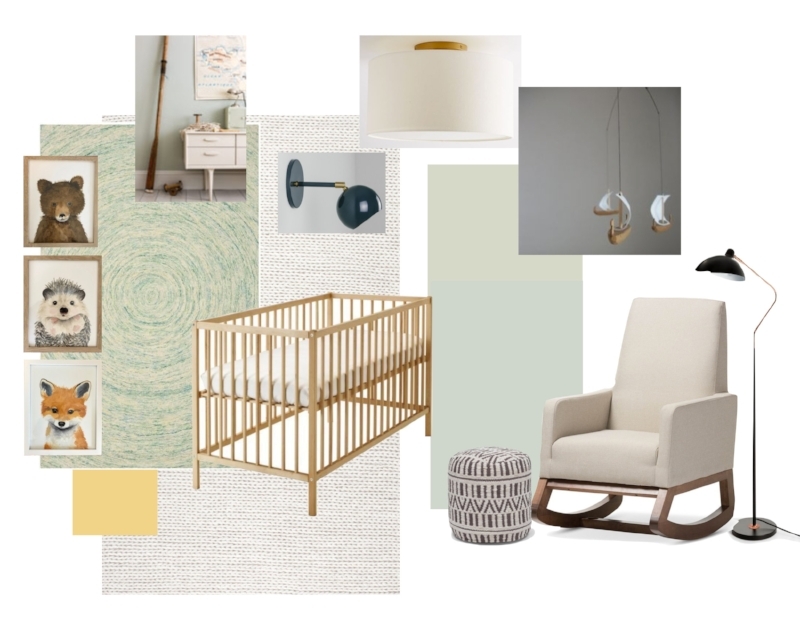 I'm thrilled to reveal the nursery that I've been working on these past six weeks. For those who don't know me, I'm Nicole Cole, a full-time Interior Designer and Stylist living in Philadelphia. This is my second time participating in the One Room Challenge as a guest participant and I'm so excited for the *almost* instant gratification that having a six-week design challenge brings. 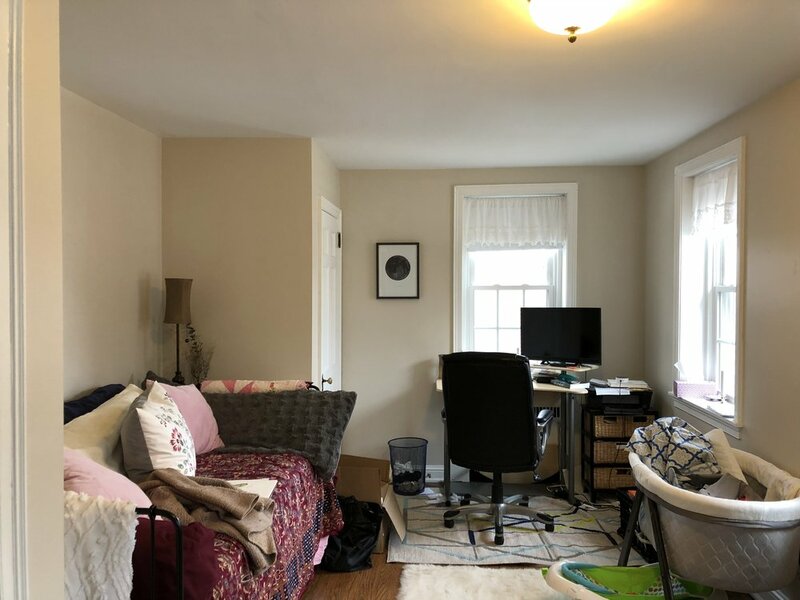 Over the last six weeks this space went from an office/guest room/catchall room to a nursery for this family's newest family member set to arrive next month. The new mom to be (Jessica) asked for a peaceful space. So I went with a lot of soft and almost ethereal (like a newborn babe) palette with some warm woods and charcoals thrown in to keep it grounded. 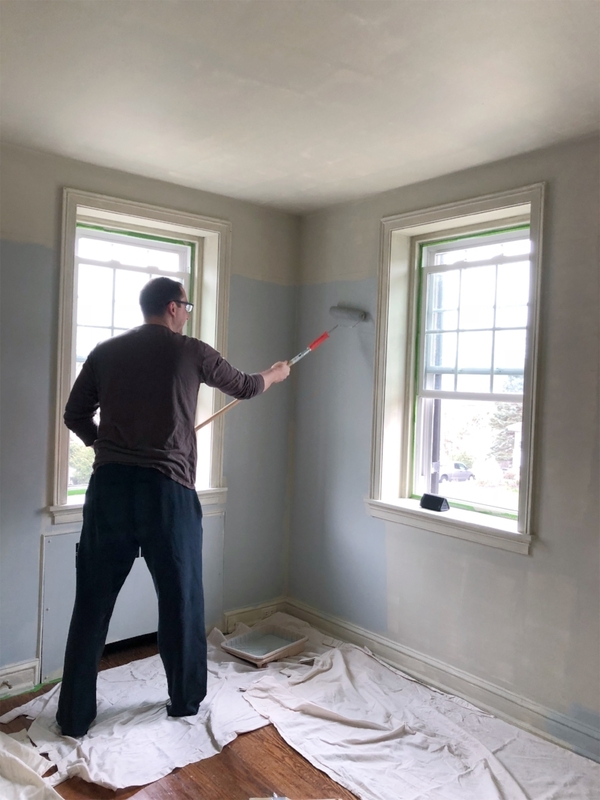 The house has a colonial feel architecturally, so I took that as a starting point for the colors and paint treatment and then incorporated some modern, clean lined touches because a little bit of tension in a room makes for good design. Let's just revisit where this room started, shall we? Can you believe how much bigger this room looks? This is almost the exact same framing in the before and after. It's so bright and fresh! Even with more furniture pieces in it than before! Goodness I love design (ahem, ok, I'm done geeking out for a minute). Since the space is long and narrow, we ended up going with two layered rugs as a standard size wouldn't fill the space enough and we didn't want to go with something custom. 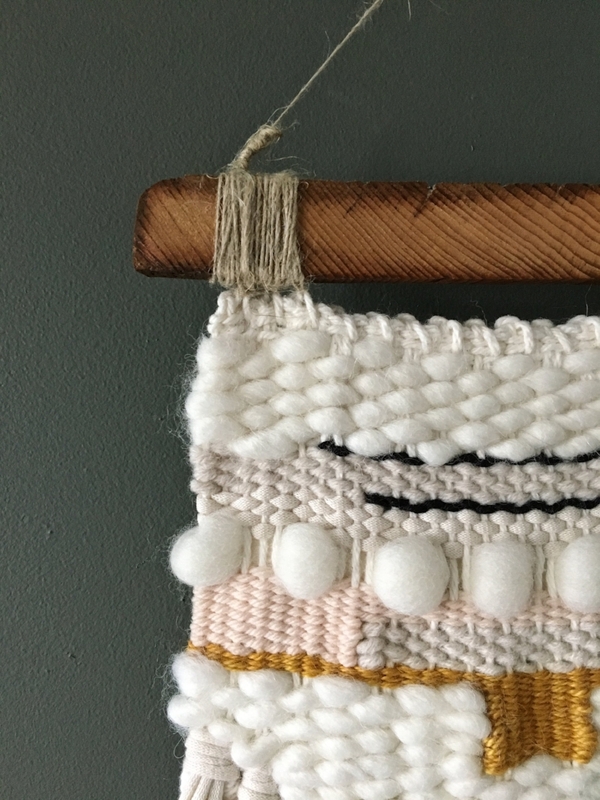 A soft wool woven ivory one laid the base while the geometric jute blend adds interest and pulled together so many of the other colors from the room. 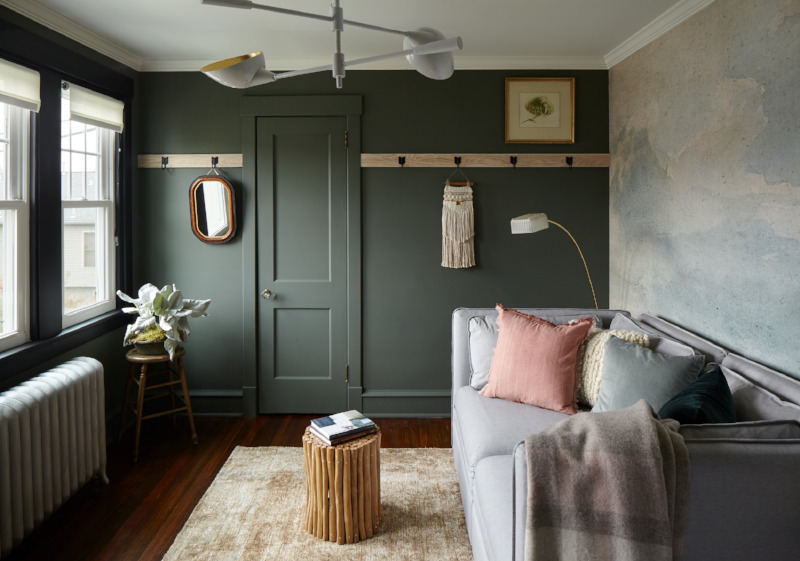 Farrow and Ball's gorgeous paint colors set the stage for the walls. I chose Farrow & Ball No. 22 Light Blue for the lower portion and for the upper portion of the wall I chose Farrow & Ball No. 266 Mizzle. Most of the work we completed on the room was more on the decorating side of things....paint, furniture, accessories...but one construction project we took on was the built in daybed. I went into more detail on the construction process during the Week Five post and now she's all dressed up and ready for some serious lounging. Even before baby Oliver arrives I think mom and dad are gonna wanna curl up here for afternoon naps and book reading (I know I want to). This built in daybed adds more functionality to the space in between the closets than the previous freestanding one. 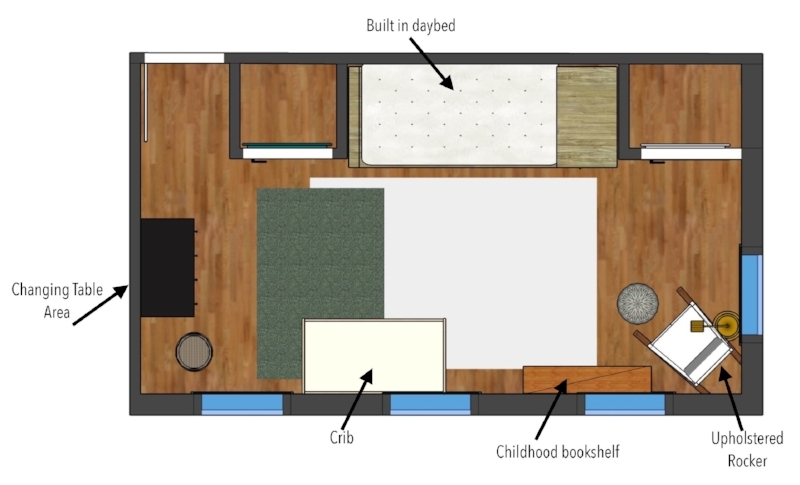 We added a huge drawer for storing extra bedding below as well as a bookshelf and little cubbies for secret stashes. A heathered grey fitted sheet covers the twin mattress and is easy to just throw in the wash if needed. 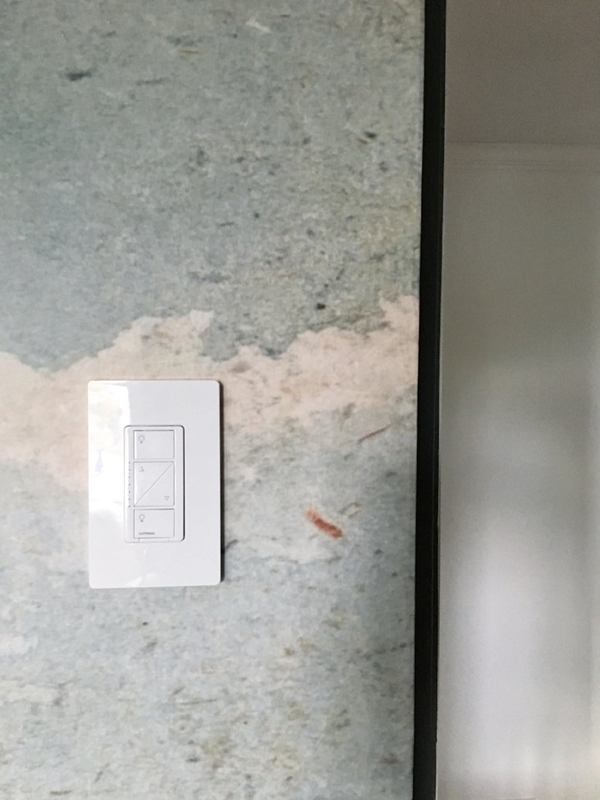 The The ABC artwork from Jenny's Print Shop was an inexpensive and easy way to add artwork to the wall, and the wall lamp is perfect for late night reading (and comes with a dimmer!) I added a low maintenance snake plant that gives some height to the space and a brass elephant because no matter how hard you try, animals of numerous sorts just seem to make their way into a nursery....the little fox print was something Jessica had picked up prior to the project and I love how the orange tones play with the blues and purples in the room. A comfy rocker is a must for late night soothing or a comfy spot to nurse. This one has great lines for tucking right back into the corner. The pouf from Article brings in more of that grounding charcoal color and can transfer to other areas on the house as well. It's perfect for putting up tired feet at the end of the day and will be nice and soft when Oliver starts toddling around. The lamp adds a modern feel and also doesn't feel exclusively "baby", it has a foot operated switch which is great for when mom and dad's arms are full with babe. The bookshelf was a piece that Jessica's dad made for her in one of her first apartments in Philadelphia and fits perfectly under the window. We painted it a warm charcoal grey (Sherwin Williams "Black Fox") and it will serve as the perfect spot for a glass of water, some baskets for other smalls to keep close at hand as well as toy and book storage. The room wouldn't be complete without a few vintage/antique touches. The mirror has been in my stash since I found it down in Jacksonville, Florida about a year ago...it pulls some of the dark wood tones from the changing table and is especially pretty with a little bit of the de-silvering from age. This simple Ikea crib is perfect for adding a minimalist vibe to this space. A beautiful green throw knitted by Jessica's long time friend, Nicole (hi Nicole!) works perfectly with the room's color palette. The ceiling light is a simple, understated drum shade and draws you eye up to the ceiling which we painted the same color as the upper portion of the walls. I had seen a delicate looking mobile with ships on Pinterest but all the sources I looked for on Etsy felt too heavy to me. So I decided to make my own version as a gift to these new parents-to-be. I partnered with Stephanie from Share Studios to use her beautiful handmade paper for the sails because I love the way the light shines through it, plus, she's an incredible artist and I love supporting other creatives when I can. The boat hulls are carved from Catalpa wood I had laying around the workshop. I hope this trio of ships gently "sailing" above Oliver inspire him to pursue adventure and curiosity. This vintage French dresser was THE PERFECT size for a changing table. We made a wood frame to hold the changing pad. It can easily be removed when Oliver outgrows it and transitions to a dresser with display space on top. The three drawers provide tons of storage for all the baby accoutrements. A shelf above give some good display space for decor items. The lion head is a beautiful wool felted handmade piece from Groh Artifact. I'm smitten with all their pieces and would love a collection for my own home! The lion symbolize courage, bravery, and leadership, all great inspirations for a little one coming into this world. The wall basket is a thrift store find and keeps wipes and burpy cloths close at hand. Well, that's it for this round of the ORC, thank you so much for all your kind words and support along the way! Thank you to Linda of Calling It Home for putting on this inspiring event and for House Beautiful and the Home Love Network for supporting us along the way as well! And be sure to see the final reveals of the other incredible guest participant rooms here as well as the featured designers here. Earlier this month over 200 guest participants and 20 featured bloggers revamped spaces in just seven weeks during the One Room Challenge. As part of the challenge, I finished up my Office/Guest Room that had sat relatively empty for almost two years and there were so many great rooms I thought I'd share a few of my favorites. This master bath renovation from The Grit & Polish has such a great mix of traditional and modern design elements. I love the bench near the shower area, it always gives an extra bit of luxury when you are able to have a piece of furniture in a bathroom. On our "forever house bucket list" is a library space and this home library from Natasha Habermann is giving me all the feels. The dark blue bookshelves and green leather Chesterfield (which is also a pullout!) give the space a warm and welcoming feel. This narrow sunroom turned breakfast nook has my heart skipping a beat. First of all, THOSE WINDOWS!!! Secondly, stenciled floors! After living in the south a blue ceiling always catches my eye. I admire the clever use of this narrow space off the kitchen as a breakfast nook and I wouldn't mind enjoying a cup of coffee and croissant while gazing out those windows on a quiet morning. For you fellow mural lovers out there, Ashley's office makeover included this incredible mural that she hand painted over most of the seven weeks of the challenge. I'm digging the graphic look against the traditional wood craftsman trim in her San Diego home. Ashley also put together some great Ikea hacks and offered some smart solutions for office storage. Coco & Jack's ultra cozy living room makeover complete with fireplace feels just perfect for this upcoming winter season. The white oak built ins flanking the fireplace are minimalist, yet warm, and the shiplap peeking from behind adds the perfect amount of texture. I'm swooning over the Triplo sofa from Article and am pinning it for future client projects. The bold blue walls and teal furnishings in Old Home Love's living room space make for a rich and inviting feel. They carried the bold blue into their kitchen as well and I love how it pops against the original finishes and textures of their old home. Megan always has a great eye for eclectic design and I'm constantly eating up everything she puts out into the world hoping that I'll absorb some of her good eye for style. She purchased a lodge in upstate New York earlier this year and took on the task of renovating the living space for the ORC. One of my favorite parts of the design was her solution for this simple record storage, and I'm always a sucker for a Windsor chair. Another blue-hued beauty of a room. Kirsten from Simply Grove made over her in-laws living space. Her use of a partial wall of paneling on the walls add some interest and detail without overwhelming the room in blue and her choice of furnishings and accessories add richness and texture to the space. This soft and soothing bedroom palette from Brittany of Brittany Makes feels like a vacation every day. Her mix of vintage textiles and modern elements made the space feel fresh, yet cozy. I you want to take a peek at the full list of reveals, check out the guest participants and the featured designers and stay turned for the next challenge coming spring 2018! The room had good bones and nice details, but it was definitely lacking personality and style. Looking back at these pictures this room doesn't even feel like the same space. What a difference color, some fun fixtures, and layering of great pieces can make! So without further ado, let's get to the pretty pictures. And here's the completed space! The last layers of details and accessories make it feel so cozy. 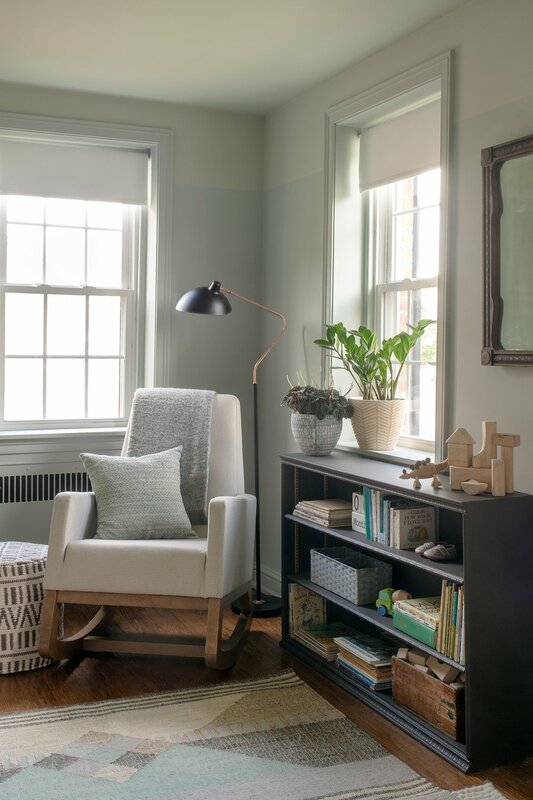 I can't say enough about Benjamin Moore's Rainy Afternoon, the perfect moody green that shifts throughout the day and is so soothing. The Anewall mural is the perfect backdrop with the green walls. To bring some additional color into the room I added a smattering of pillows in various colors and textures, as well as a little pop of pattern. The lamp is a vintage find from my friend Tara over at Scout & Annie. I love it's simple swoop and textured rectangular shade for a bit of interest. It's a great reading light for the other side of the seating area. I was so excited to finally have the right project to use one of Made of Cloth's gorgeous screen printed pillows on a project! I chose the Splotches pattern with Silver on Oyster and I love how it mixes so effortlessly with everything else in the room. A cozy wool throw in soft colors is perfect for snuggling up with on these cold days ahead. My big-haired lady that I've been toting around since we lived Jacksonville finally found her home above the pegboard I built using the custom hooks made by my brother, Omnitasker Design. Hanging it above the rail draws your eye up in a room that doesn't have particularly tall ceilings and the asymmetrical placement adds a bit of unexpectedness in a room that could start feeling a bit formal and stuffy. And can we talk about THAT WEAVING??!!! I feel so grateful to have an original piece from my friend Sara of The Forest Fern hanging in a space that will serve as a creative workspace for me. I love the texture and subtle colors that complement the overall vibe in the room. The 1940's secretary that I searched months for and ended up finding at one of my favorite shopping haunts seems almost radiant against these green walls! A vintage Hoffman armchair slung with a cozy sheepskin is the perfect spot to sit at my computer or do some writing in the morning. The white pottery on the top of the secretary is a collection of vintage, new/mass market, and handmade pieces that I've been collecting. I recently purchased the remaining pieces to create a simple vignette that stands in contrast against the wall color and traditional style of the secretary. A close up of the display space in the secretary. I have a feeling I am going to be adding to this over time, but some of my favorite design and art books made their way in, a notecard with one of my favorite quotes by J. R. R. Tolkein that reads "Little by little, one travels far", and a dried fern frond from our garden. I left the wall over by the desk blank so that I could use it for inspiration, design boards, etc. Simple wasabi tape makes things easy to pin up and take down without damaging the walls. Here'a a couple more views of the space. And this ingenious VALLENTUNA pullout bed from Ikea. 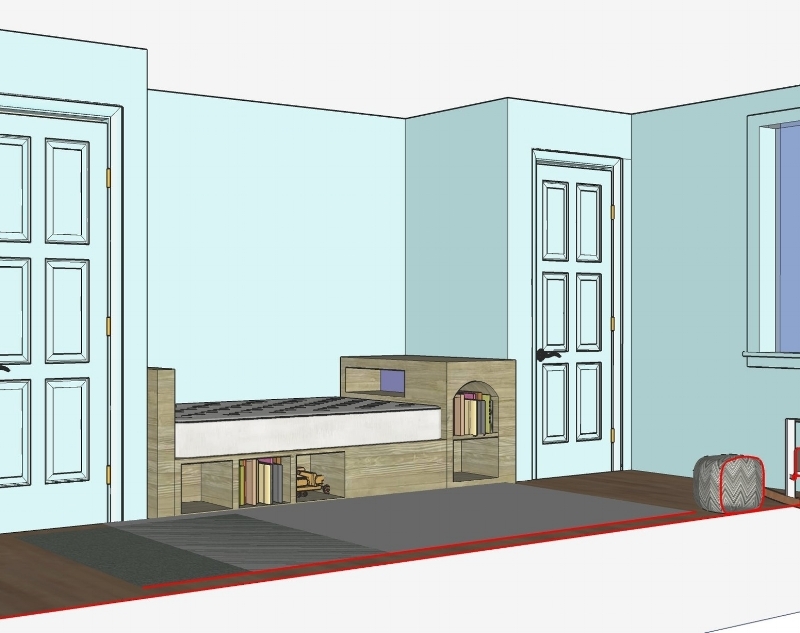 And now it's time to get down into snuggling and relaxing and creating more great rooms for clients in this space! Thank you guys so, so much for all your kind words and encouragement along the way. I heard from many of you who told me you were inspired to undertake your own makeovers in your spaces and that is so thrilling because that is what this is ALL about! Since this is my first year participating I'd love to hear what you think about the blog posts, did you find them helpful? Was there something more you wanted to know about? Were the photos sufficient? I would appreciate any feedback you have. Hey guys! Ever have that feeling like you're just not where you'd hoped to be on a project? That's been my week with the One Room Challenge guest room/office space. 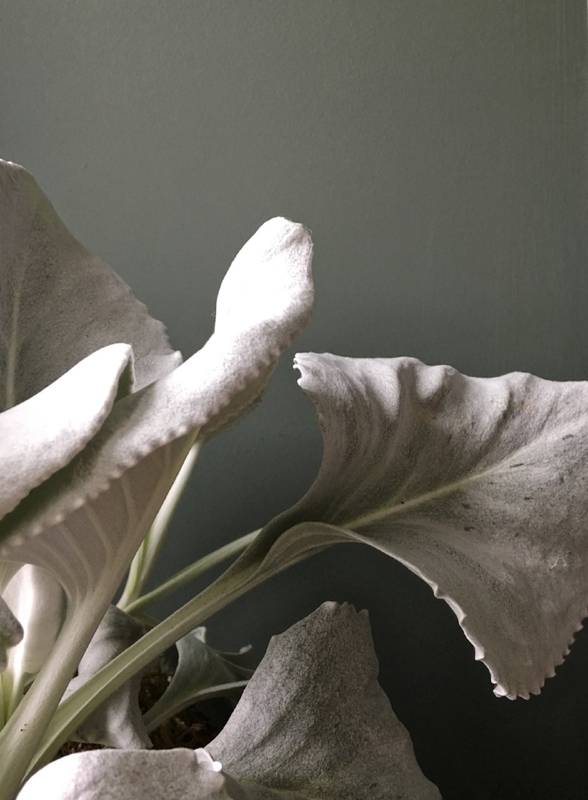 Between photoshoots for other interiors projects, planning for holiday and workshops, filling orders and getting ready for a show on Saturday it felt like I was working at a snails pace. After the dramatic push to get the space painted, working on a bunch of small stuff this week felt a little less dramatic. But nonetheless important, 'cause it's all in the details, right!? So let's dive in! I'm apparently having a little early American moment, maybe it's the fact I'm surrounded by so may influences here in Philly, I'm nostalgic for my childhood (I grew up with lots of early American style pieces), or I just wanted a cool desk with all sorts of nooks and crannies to stash my treasures. I've been thinking about getting an antique secretary for a while. I'd actually seen a really cool one when I was down in Fredericksburg last December and I've wistfully thought about how I should have bought it at the time these last months. Perhaps they might still have it? I almost made the 10-hour round trip drive to check #obsessed. So I turned to my resources Craigslist and Ebay and trolled them for MONTHS searching for the perfect old secretary. I don't have a lot of time to go shopping in person, so I like to check out these sites in the evening when I am looking for vintage/antique furniture. After months of searching, nothing. I was trying not to get discouraged because you can't rush a good vintage piece, but the One Room Challenge was quickly approaching and I was feeling a little bummed that I wouldn't have THE PIECE. On a whim one afternoon after swinging by one of my favorite nurseries, I stopped by a great vintage/junk shop a few doors down. I have found a few things here and there before and just wanted to pop in to see what they had going on. I never expected to find a secretary, but there it was, buried behind frames, mirrors, and an old sled. My heart skipped a beat and I quickly pulled the items away from it to get a closer look. "Good lines, yes...oh, I like those little spindle legs...and no ornate details at the top...good, very good" I thought to myself. The color was a little more orange-y than I preferred, but I could look past that because the form was the closest to what I was wanting. Sold. She's missing a little hardware but that's an easy fix. I spent some time earlier this week cleaning off years of grime with Murphy's Oil Soap. The color still wasn't quite to my liking and I thought about using a refinishing product to darken the color a bit but after talking to some other folks and thinking about it a little more I'm gonna keep it as is. I don't want to loose the wonderful patina it's developed over the years, plus with the dark green walls I think it might get lost if it was too much darker. The piece is stamped with a Conant Ball Makers Mark. At the shop where I bought it they told me that it was likely manufactured in the 1940's. Conant Ball was established in the late 1800's in Gardner, Massachusetts and specialized in crafting Colonial furniture reproductions and cane seat chairs. Russel Wright was a designer for Conant Ball and designed many of their most popular furniture items, I wasn't really able to find anything in my brief search on this particular secretary but I wonder if Mr. Wright had a hand in it's design. Since some of that hardware is missing and I think it could be modernized a bit anyway, I'm planning on replacing the drawer hardware and knobs. I'm still waiting on one more option to be delivered, but I'm liking the way these are bin pulls are looking. Ok, I've definitely drawn out the story of this secretary long enough. One to a couple other things. 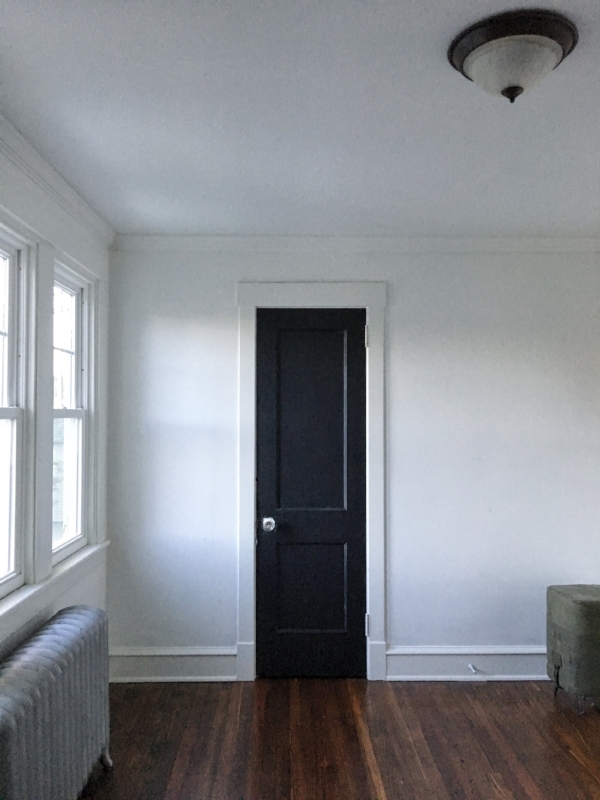 I removed all the hardware from the closet and bedroom doors and followed Manhattan Nests magical formula to remove those old layers of paint to reveal the brassy layers beneath as seen on the back side of this hinge. I started a bit of work on the hook rail that is going to run along the wall where the closet is located. It'll be a great spot for guest to hang things and also to display a couple special pieces. My brother fabricated the hooks and I've been working on getting the limed ash prepped for hanging, here's a sample of the general look.